Some breweries start out from the beginning with carefully engineered marketing strategies, while others take a more free-form, off-the-cuff approach to their products, based on whatever the brewer wants to do next. Most, of course, probably begin with a fuzzy mixture of both strategies. Before finally producing our first beer in February 2015, Barry and I spent about 9 months brewing up a storm of trial batches for only a mere handful of the initial offerings of Kent Falls Brewing Co. It's hilarious how much time — months and months — was spent trialing just a couple beers, compared to the staggering number of beers we've released since then, most of them with minimal test batch experimentation. For most of the planning phase, we only knew that we would be making one or two particular beers for certain. Being a farmhouse brewery, our first beer was obviously going to be a saison. At the time, the concept of a seasonally rotating farmhouse ale called Field Beer was kind of our intended flagship beer — although we weren't entirely sure what that even meant, for a brewery like ours. Before I became involved, Barry had the artwork, name, and general concept in place. It would be a farmhouse ale that used all local ingredients, including raw grains (oat, spelt, wheat, and rye) that would change with each season. Once I started on with the company, we got to work developing a recipe, deciding on the structure of the beer (clean, funky, sour, wood-aged, etc) and refining the house saison culture that would ferment it. Farmhouse ales can go in a lot of different directions, and at that point we figured we'd only be making one or two saisons (excluding limited barrel-aged stuff) over the course of our first year. After all, with only three tanks and two yeast strains, how many different beers could you possibly make? The amount of time spent developing those few initial beer concepts was severely disproportionate, in retrospect. Shortly after starting to sort out Field Beer, we settled on our second "core" beer. I had been spending much of my own homebrewing energy, over the several years previous, perfecting my ideal hiking beer, a Brett IPA, and I thought it would be badass to open up with a tart saison and a Brett IPA as flagship beers. As we still drifted through a dozen saison culture variations, we started refining my existing Brett IPA recipe with new yeast strains. Due to the nature of the types of beers I wanted to make, most of the R&D efforts were actually yeast related. Homebrewing gives you the opportunity to very casually and without any real pressure test out different yeast profiles in similar foundational beers over... well, all the time you want. Opening up a brewery, all of a sudden you're in this mad crunch to make sure you found the best possible combination of saison yeast out there. The best, most consistent, must management, most reliable Brett culture. How can you possibly test out all the thousands of different variations and combinations in time before you need to have a recipe locked in? But then there's the other strange challenges of developing your brewery lineup. When thinking of how to name and label my Bear Flavored beers, ideas came easy. I had a stockpile of images and endless ideas for names, but they all pretty directly channeled my own personal weirdnesses and aesthetic inclinations, and I wasn't bouncing them off of anyone else. Branding, for a brewery that isn't just your own, is a far greater challenge. Everything had to funnel together the different visions of everyone involved, while representing the amalgamation of the brewery identity as a whole — whatever that was. We were still figuring it out, after all, in how we chose to name and label the beers. Finding a name for our Brett IPA was, oddly enough, possibly the most difficult single thing in the whole long process — as far as creative spontaneity, failed solutions, and time spent before coming up with something that finally worked. We bounced ideas around for at least a month. At my birthday party that year, I passed around a notepad and had friends write down ideas, then vote on favorites. For the longest time, we couldn't quite nail it. But once one idea clicks, it's weird how immediately and easily other ideas click, and the whole trajectory of what you're doing inexorably shifts. Finally, possibly by accident, someone came up with"Waymaker" as the name, and at last, a name actually stuck. I remember thinking about adding coffee to the Brett IPA. Suddenly it hit me: Coffeemaker! The name came with zero effort, because it just made sense, and was kind of dumb and tongue-in-cheek, which is very much Kent Fall's. What about adding fruit to the Brett IPA? Juicemaker! Et cetera. It can take a month to lock-in one concept, and then only hours to establish a quarter dozen more. You'll hear, from new breweries, that you can never fully anticipate what your first few years will be like. Business plans are just a nice idea you create to show to investors and the bank. Reality will dictate the real flow of the business, and it will almost never resemble the plan. But usually these reflections on the insane momentum of running a brewery are in relation to production growth and sales and whatnot. I suppose, for better or worse, we had a far more flexible vision of what our brewery identity would even be than most do. Or maybe not, even. I don't know. 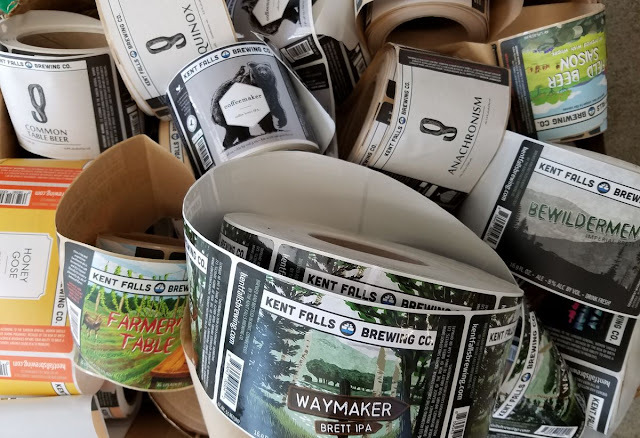 We had a very good idea of the types of beers we would make at Kent Falls. We were going to focus on farmhouse ales and sours and Northeast-style IPAs and a couple stouts here and there with the other varied oddball experiments on the side. In other words, I was going to continue to brew basically the same beers I would have been brewing as a homebrewer anyway. But amidst all the things we wanted to make, we assumed we would have to start out making only a few of them. Produce a lineup of half a dozen or so core beers that would see relatively frequent distribution, and fill in the edges with some other stuff, some more limited adventures. That's how breweries work, right? I made charts and graphs and notebook scribblings about flagships and brew frequency and hop usages. We assumed that, as brewers, you just sort of establish those things, and the market drinks them up, mostly, and you see what does better and what's weak and go from there. Scale up on some things and scale down others. One of the main factors determining these initial beers, the focus of a "core" lineup, is yeast. As a homebrewer, this is something you're aware of, but it doesn't dictate your brewing the way it will professionally. And in plotting out your brewery, you will realize just how limiting this sort of planning can be. Especially if you to want to do some oddball things with unique yeast cultures, or if you want to use certain yeast cultures, but only sporadically. Now, you either have to have an in-house yeast propagation system of some sort (which could be costly, eat up the floor space of your tiny brewery, and would demand more man-hours that you don't have), or you have to stick to using the same yeast for at least several batches in a row. Ordering a fresh pitch of yeast for each batch would be a significant cost; money that could be better spent more efficiently. So your schedule is, to a large extent, dictated by how many yeast strains you're able to bring into the brewery, how long you can / plan to keep them going for, and how affordable it is for you to order yeast cultures here and there that you only plan to use for a few batches. There's a reason that most breweries brew 95% of their beers with one house strain, and there's a reason it's usually a nice versatile American or British strain. In practical terms, if you want one of your core beers to be a 100% Brett IPA with a unique yeast culture that the market still barely understands, that means you have to either brew that beer essentially all the time (hoping it will work as a true year-round flagship), or alternate it with a few other beers (using that same unusual yeast culture) to space out batches and not flood the market. Or finally, you could brew the one beer a couple times for one period of the year, then dump the yeast and switch to a new culture for that tank. Here was a new challenge: how many different beers could I come up with to be fermented with a 100% Brett culture that regular bars and restaurants would be willing to repeatedly buy? Coming up with these ideas in a homebrew setting is one thing, but now, as a production brewery in an area without a ton of craft beer-centric bars, you have to convince numerous bars and restaurants and beer halls to take in kegs of your wacky ideas. As much as I really wanted to brew a 100% Brett IPA as a core beer, could I really sustain the culture as a year-round thing? Originally, due to the nature of the beers, some practical yeast management concerns, and the whole general Figuring This Out process, we didn't want to bring in a third yeast culture beyond our saison and Brett cultures. We had three tanks. Three tanks, to keep two yeast cultures alive and healthy. We had to devise a core lineup of beers around those two unique house cultures. It was actually quite a fun challenge. It forced me to be creative, but ultimately allowed us to brew most of the stuff that I wanted to focus our core lineup on anyway. We'd be brewing a Brett IPA (and several variations thereof), goses, and an assortment of saisons. The only types of beers that I was fond of but that I couldn't really get to, with that setup, were clean IPAs. But those could wait to come in later, especially as we were waiting to build up our hop resources. And still are — hop contracts are a whole other logistics nightmare that I won't even dive into here. But the market is a force with a strong will — a will that is fortunately pretty easy to interpret, in this industry — and we were in a position to be adaptable. Or at least a mindset to be adaptable. The nature of our lineup was not set in stone. And the nature of our lineup — the beers I made in the first year, but more precisely how often I made each of them — was something that was shaped by the sort of responses we saw. As it happened, the market seemed to demand the type of brewing I was most comfortable with anyway. The type of brew schedule I would prefer to do regardless, because it's the same approach I took as a curious homebrewer with a terrible attention span. The market demanded variety. I like variety. We found that beers moved fastest, and thus were served fresh and at their peak quality, when we didn't brew any one beer too much all at once. With a few months in between releases — and a number of beers released only on an annual basis — the market could "miss" things they hadn't had in a while, rather than getting bombarded with the same offerings constantly. This realization isn't new — there's a reason why seasonals and one-offs have become such a big thing, even for older, flagship-oriented breweries — but I think this dichotomy is growing more and more prevalent and unavoidable. Perhaps our experience would have been less extreme if we had a tasting room or a brewpub, and regular patrons expecting certain things to always be there. But we had to build a brewery brand based on distribution only, and thus, the frequently-rotating taplists of other people's bars. Beer bars inherently favor variety these days. So, not by calculated planning or lengthy board meetings or strategy sessions, but by instinct and reflex and a readiness to embrace experimentation at the first opportunity, we became the type of brewery that releases about 50 distinct beers in its first year of operation. We saw quickly that the market likes variety. This is great for me, because I also like variety, and I like brewing different things. But the degree to which the market pushed us toward variety was still shocking to me. And it made me question: is the flagship (or core lineup) model of brewing, at least for small new breweries, starting to die? How much will the rotating nature of beer bar draft lists shape the future of the brewing business? More thoughts on that over the next few weeks. In the meantime, if you enjoy my writing or reading about fermentation in general, please consider pre-ordering my book, The Fermented Man, on Amazon, and follow me on Twitter and Instagram for more regular updates. Wonderful blog post. Thank you for devoting time to writing it outside of your schedule.